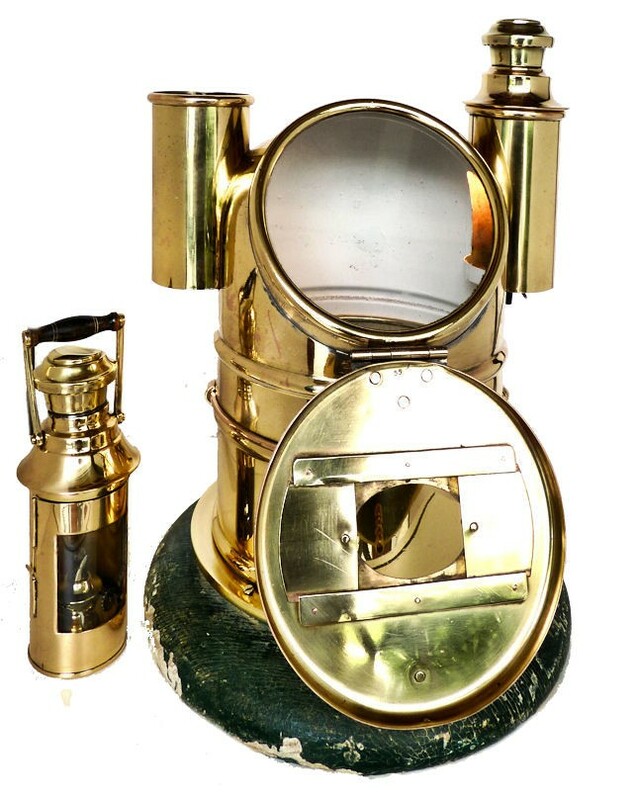 To view our current inventory of antique binnacles, compasses and telegraphs, click here! 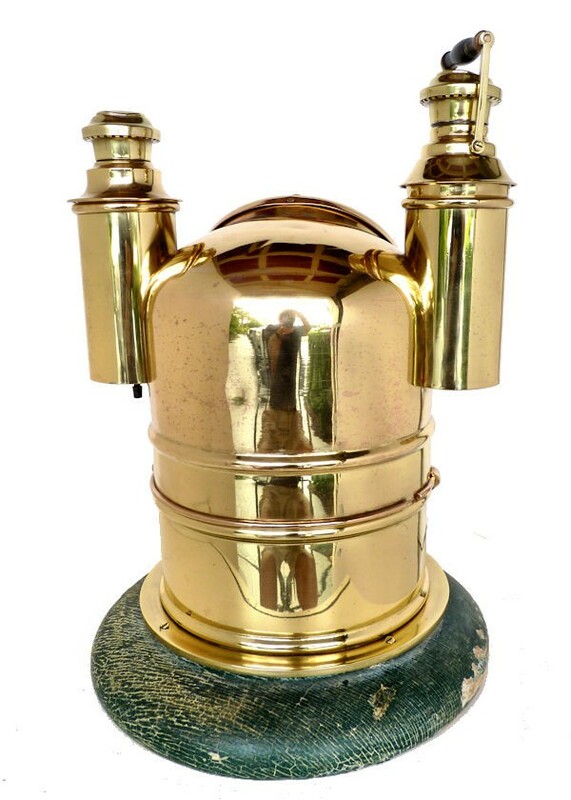 This Interesting Binnacle Has Been Sold. Thank you! Modified to preserve the top section only, this display binnacle makes a dramatic statement of importance. It is a perfect gift or as a focal point in any decor. 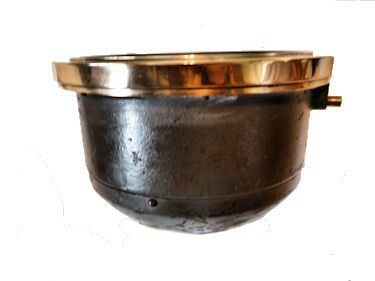 Presented is an upper portion of a binnacle that was removed from the binnacle trunk upon which it was mounted, and then placed on a turned wood base for display. It is in good condition as a display piece considering its age and use. 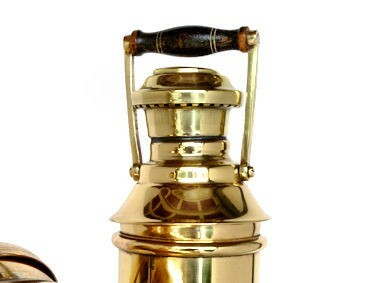 The twin burner design dates back to the 1860's. 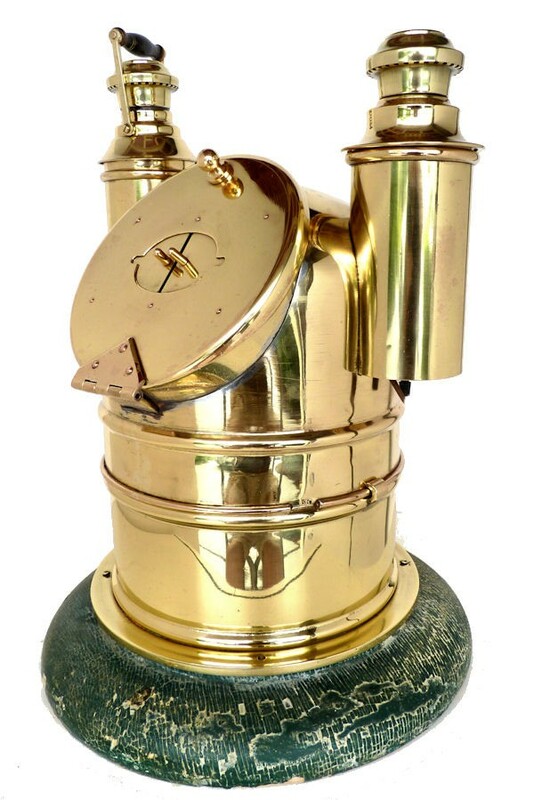 The brass hood has a large hinged round viewing port in front that is flanked by a kerosene burner housing on each side. One of the burners was removed so that it could be electrified and an electrical receptacle was installed. It lights the inside well. The other burner is not original, but fully functional. The tops of both burner caps are dented. The wood base was painted a blue/green and has weathered with age and now is heavily crackled which give a pleasing rustic appearance. The appearance is very striking compared to contemporary binnacles which are most prevalent today making it an ideal display piece. The partially gimbaled compass has a 6 inch Ritchie card made from Mica and linen that dates from 1900. 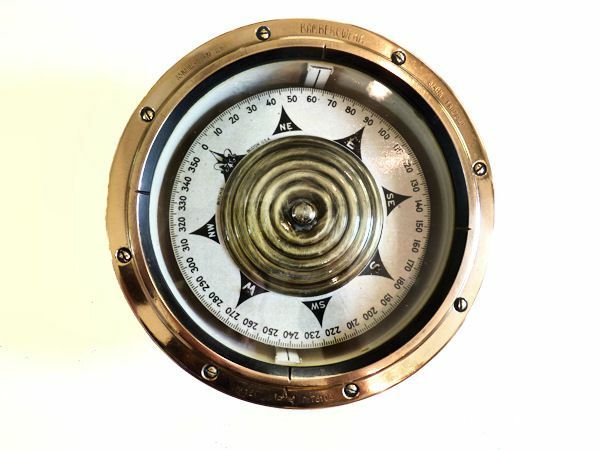 The compass measures 8 3/8" in diameter overall and the card is 6" in diameter. Stamped on the bezel along the edge is AZKANIA WERKE A.G. BAMBERERE WERKE BERLIN-FRIEDENAU and opposite DKS 16 D (a Crown) Nr 76103. The solution has been drained from the bowl for conservation. On the outer circle the compass rose is divided in degrees with the major mark at every ten degrees. This convention came into favor at the Turn of the 20th Century. The inner circle are in Cardinal Points, N.S,E,W, and quarter points, NE, SE, SW, NW. The outer circle was graduated in degrees from 0 to 359 . The north pointer was an ornate Fleur des Lis. At its base, the card is marked Ritchie, Boston. As seen it makes an impressive display, and will admired it for its overall good looks. Diameter of viewing port 6 1/2"
SHIPPING & PACKING: The cost of shipping, packing, handling, and insurance to your destination, must be calculated. You may email us before bidding to get these costs. We price our shipping honestly, but we expect to be reimbursed for the nominal cost of packaging materials and handling. International buyers welcome. 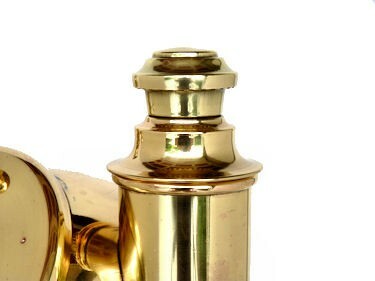 We have satisfied customers in Argentina, Australia, Austria, Belgium, Bermuda, British Virgin Islands, Canada, Chile, China, Czech Republic, Democratic Republic of Congo, Denmark, Estonia, England, France, Germany, Greece, Holland, Hong Kong, Hungary, Iceland, Ireland, Israel, Italy, Japan, Kuwait, Latvia, Luxembourg, Malaysia, Martinique, Mexico, New Zealand, Norway, Nova Scotia, Panama, Poland, Portugal, Puerto Rico, Romania, Russia, Saudi Arabia, Scotland, Singapore, Spain, Sweden, Switzerland, Thailand, Turkey, United Arab Emirates, USVI and the Eastern Caribbean.